Marketing templates for Excel provide the most important analytical tools for marketing managers as Excel templates providing automatic analysis on input data. 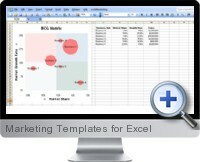 The Excel marketing templates combine analytical reports with charts so that marketing strategies and product performance metrics can be analyzed quickly and easily. BCG Matrix - a growth share matrix in the form of a bubble chart quadrant for analyzing market dynamics of business units or product lines. Perceptual Mapping and Positioning Maps - graphical visualizations to present the perceptions of customers or potential customers. Marketing Metrics and Excel Dashboard Report - a dashboard summary of key marketing performance for executive reporting. Benchmarking - the comparison of marketing metrics against standardized base values for performance reporting. Radar Charting - a visualization of marketing indicators within a two-dimensional chart of three or more performance metrics represented on axes starting from the same base point. Performance Gap Chart Analysis - a comparison between actual and potential marketing performance. Pareto Analysis and Pareto Charting - a combination of individual values in descending order bars and the cumulative total as a line. Trend Chart - a representation of key marketing performance indicators over time. GE/McKinsey Matrix - a nine cell portfolio matrix comparing strengths between business units and industry attractiveness.